Office glass signs and acrylic company plaques are commonly used as an alternative to metal plaque signs as they are cost-effective and available in a range of bespoke sizes and colours. 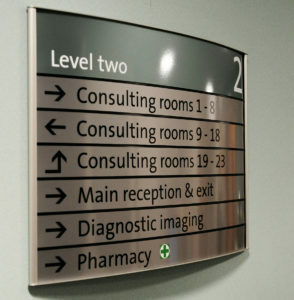 Also ideal for smaller types of signage, plaques offer a modern-looking surface to which graphics or text is applied to display an official name of the logo. A plaque is a great way to mark an area of importance or as a greeting sign for a reception area or lobby. They are often used as door signs or room numbers, however more often than not an acrylic is used to create the room plaque. We design bespoke signs, plaques and room signs to meet your requirements. We use a variety of different materials including Perspex, glass, brass, aluminium and steel. They can be mounted onto plinths or fixed to the wall with raised wall fixings. Vinyl lettering, logos or digitally printed graphics are normally applied to the rear of the plaque’s surface to protect it from being damaged and to ensure the plaque has a constant shine to it. 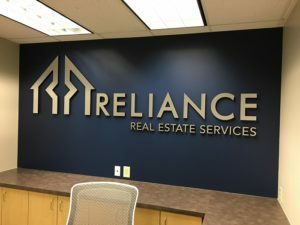 Presenting a professional image of your office is vital for all businesses big and small and so a well-made office sign with either your company logo or name on it will truly represent a great image of your company that all visitors to your business will see the moment they walk through your door. Office wall signs are the most effective of all the types of corporate signage available and there are many ways to incorporate your company logs onto the walls of your workplace. However you’re not restricted to just plaques and wall signs, we do have a range of custom-made letters available in a variety of materials and colours to choose from. Office plaques are usually produced in either glass or acrylic and the logo is usually produced in a vinyl however for a more three-dimensional look the logo can be produced in cut acrylic or metal so that it looks raised. Made typically from clear acrylic, the acrylic wall signs are made-to-order in a range of sizes, shapes and styles. For transparent plaques, clear acrylic is used for the face of the sign with the logo or text applied to the reverse side to protect it from getting damaged. The company logo or graphics can be digitally printed to create a high-resolution image or individually cut from a range of coloured vinyl. We’re also able to produce plaques in a range of non-transparent coloured acrylic for a different effect. Vinyl graphics can then be applied to the face of the sign. 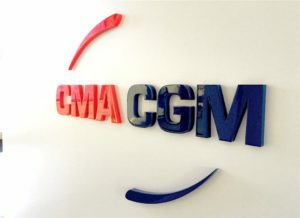 For a three-dimensional plaque, individually cut acrylic or stainless steel can be applied to the face of the sign if you’d like to create a raised 3D logo on your office sign. All clear acrylic plaques are flame-polished for a super-smooth finish and can the mounted to a wall using a range of fixings including chrome barrel fixings or with adhesive tape, should you wish to hide the fixings. Our acrylic plaques are available in a number of sizes and thicknesses. Acrylic plaques are typically produced in a range of thicknesses such as 3mm, 5mm, 7mm and 10mm. Made from toughened clear glass, the glass wall plaques are bespoke and made-to-order in a range of sizes and styles. For transparent plaques, clear toughened glass is used for the main face of the sign with the main logo or text applied to the reverse side of the sign to protect it from getting damaged. The logo or graphics can be digitally printed to create a high-resolution image, or individually cut from a range of coloured vinyl if desired. We’re also able to manufacture the plaques in tinted glass if required. For a three dimensional plaque, individually cut acrylic or stainless steel can be applied to the face of the sign if you’d like to create a raised 3D logo on your office sign. All glass plaques have polished edges for a super-smooth finish and can be mounted to the wall using a range of fixings including chrome barrel fixings or with adhesive tape, should you wish to hide the fixings. Our glass plaques are available in a number of sizes and thicknesses. Glass plaques are typically produced in a range of thicknesses such as 5mm and 7mm, however if you require an alternative size then please speak to a member of our sales team. As an alternative to using acrylic, we’re able to produce your business plaque from either mirror polished stainless steel or brushed stainless steel. The plaques are bespoke and made-to-order in a range of shapes and sizes. Typically produced in a 304 grade or 316 grade stainless steel, the plaques are ideal for both internal and external use. A company logo or a series of text can be engraved into the steel and colour filled in a range of paint colours to meet your brand guidelines. Alternatively, cut vinyl can be applied to the steel plaque if you wish to modify the sign at a later date. There are also a range of alternative office signs available in a whole range of materials, colours and sizes which are all custom made to suit your requirements. If you need a sign for your office wall but would prefer not to have an acrylic or glass plaque then we’re able produce company logos or text in a number of ways in which they can be individually mounted to the wall to create a stylish company sign. Your company sign can also be illuminated in a number of ways to create a really stylish wall feature within the office or within the reception area which visitors and clients will be greeted with upon arrival. Highly polished stainless steels and brushed metals are often used to create logos as they’re hard wearing and long lasting however we’re also able to produce bespoke signs in a number of plastics and acrylics.